The dry June continues. Sure there have been a few showers here and there, but these have been isolated and there has been no major rain now for a couple of weeks. My garden was getting dry. Lotus pot was half empty due to evaporation. I don't recall any shower longer than a few minutes during the whole week. At the same time, it's not been bright sunshine and blue skies, but somewhere in between. Quite hazy with sun often breaking through in the afternoons. Altogether, nice weather! BUT, as I mentioned last time, it has been windy. The wind continued all week. I head tales of sea sickness from some divers, and the waves were still big at the beaches. Be careful and don't ignore the red flags at the beaches. By all means get a suntan, but if the seas are rough, please swim in the hotel pool. Looks pretty bad, right? Rain, rain, rain, scattered thunderstorms. Not holiday weather. Well, here's the game. 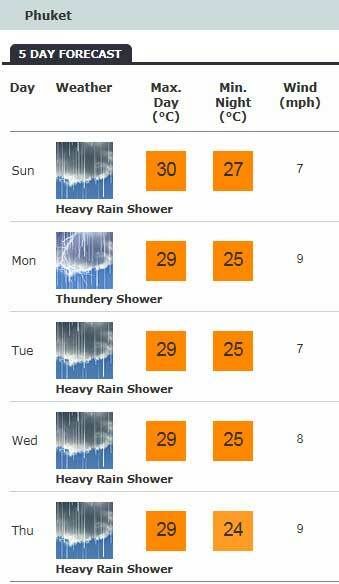 Let's see what the real weather is like over the next week... I can assure you it will be much nicer than the BBC or Yahoo predict. A bit of rain would be nice actually, this is supposed to be wet season and Phuket's greenery needs a shower! After a working week, Saturday is my day off - worked in the garden in the morning and although hazy I still got red shoulders. Kids played in their little inflatable pool during the hot afternoon. Later on, I took a little drive to take photos. First stop - the Heroines Monument which I will write about on the Phuket Blog later. 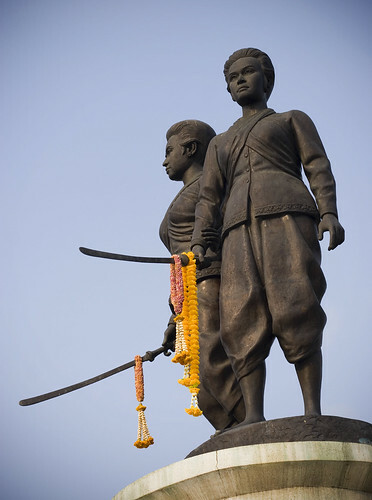 Just about every visitor to Phuket will see this statue of the 2 ladies with swords, commemorating the battle of Thalang in 1785 when the people of Phuket beat off the invading Burmese.